1. Thick film heaters or calls Thick film heating elements are manufactured in a completely different way than ordinary heating elements. A thick film heating element consists of a stainless steel or ceramic substrate (plate), on which an insulation layer is printed, then a layer of resistive paste, followed by a contact and connective layer, and finally all these layers are covered with top enamel layer. Maximum protection from dirt and dust is essential through the whole production process. Thick film heaters production runs in air-conditioned areas meeting the requirements for rooms with high air purity class. 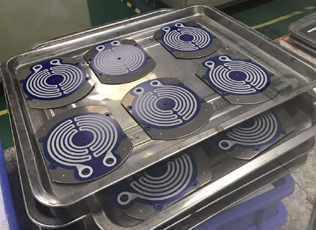 Thick film ceramic heating elements are used when high temperatures are required, fast responses or temperature gradients are needed or products need to be heated in certain areas in a targeted way. Thick film heaters typical operating temperatures range from 300°C to 700°C (550°F – 1300°F) producing infrared wavelengths ideal for caramelization of breads, warming and heating of foods, curing of coatings, and softening or welding of plastics.Thick film ceramic elements heaters are capable of transferring up to 92% of their input as radiant energy, maximum efficiency is reached when the emitted wavelength and the absorption spectrum of the material to be heated are optimized. 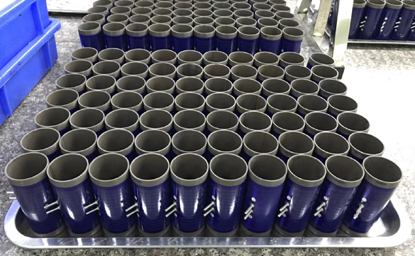 The performance of Thick Film heating elements with ceramic base material is dependent on the respective application or area.Thick Film heating elements was created to maximize heater efficiency and performance while maintaining durability and design flexibility. The possible power density without thermal compensation is approx. 5 to 10 W/cm². For higher power per area rates (up to a maximum of 30 W/cm²) the heating element has to be connected to a compensating material such as aluminum, copper or brass. Thick film heating elements are designed to suit your application. Shape, size and electrical properties can be set and optimized for each heating job. 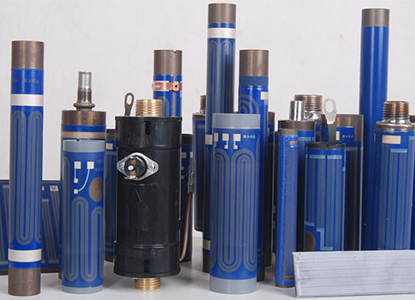 In addition we can provide electrical connectors, thermal sensors, temperature limiters and controls. Also we are experienced in assisting in solutions for installation of thick film heaters in appliances. Thick film heating elements are intended for contact heating of flat surfaces and for heating of liquids through a flat wall. Compared with an ordinary tubular heating element, a heating element on a sheet metal provides substantially better heat transfer into a flat wall. Thick film heating elements can also be of benefit in applications, where low thickness of the heating element is important. If you are considering the application of thick film elements, a consultation with our Technical Department is highly recommended for detailed specification of particular requirements.